CANTON, Mass. 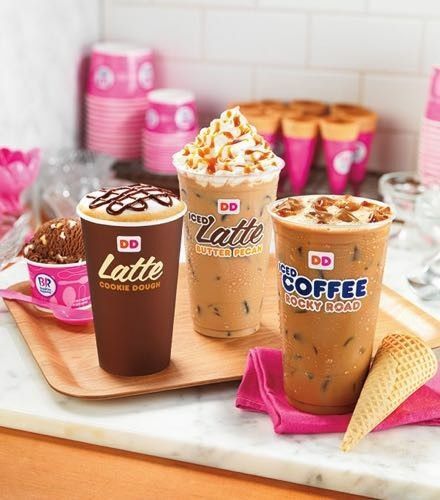 (March 4, 2015) – With spring nearly here, Dunkin’ Donuts has a big scoop for coffee lovers, today announcing the return of coffees and lattes featuring ice cream flavors inspired by its sister brand, Baskin-Robbins. Back by popular demand, Dunkin’ Donuts is once again putting the “BR” in brew by bringing back fan favorite flavors Cookie Dough and Butter Pecan, along with a cool new addition to the lineup, Rocky Road. All three flavors are available in Hot and Iced Coffee and Lattes. Dunkin’ Donuts’ new Rocky Road Coffee and Lattes bring together the tastes of rich chocolate, marshmallow and almond flavors, a combination sure to rock any coffee drinker’s world. Dunkin’ Donuts’ Butter Pecan features indulgent butter roasted pecan and sweet cream flavors, while Cookie Dough combines two classic flavors, cookies and coffee, for the ultimate sweet treat. Additionally, Dunkin’ Donuts is making this month even more exciting for coffee lovers with a special K-Cup®* pack offer. Through April 26, guests can purchase two boxes of Dunkin’ Donuts K-Cup® packs for $16.99 at participating Dunkin’ Donuts restaurants nationwide. Perfect for busy, on-the-go guests, Dunkin’ Donuts’ K-Cup® packs can be enjoyed in a number of varieties this spring including Dunkin’ Donuts Original Blend, Dark Roast, French Vanilla, Hazelnut and Dunkin' Decaf®. *K-Cup® is a trademark of Keurig Green Mountain, Incorporated, used with permission. K-Cup® packs are for use in Keurig® K-Cup® Brewing systems. Founded in 1950, Dunkin' Donuts is America's favorite all-day, everyday stop for coffee and baked goods. Dunkin' Donuts is a market leader in the hot regular/decaf/flavored coffee, iced coffee, donut, bagel and muffin categories. Dunkin' Donuts has earned the No. 1 ranking for customer loyalty in the coffee category by Brand Keys for nine years running. The company has more than 11,300 restaurants in 36 countries worldwide. Based in Canton, Mass., Dunkin' Donuts is part of the Dunkin' Brands Group, Inc. (Nasdaq: DNKN) family of companies. For more information, visit www.DunkinDonuts.com.